The General Tyre 4x4 tyre - Grabber AT - is designed specifically to offer high grip and good handling on both, on- and off-road, applications. The rugged structure of the Grabber AT protects the tread and sidewall from damage, whilst ensuring comfortable driving characteristics and high mileage performance. The new tyre compound and tread pattern has been developed with the emphasis on safety for on road and off road. The wet braking and noise reduction performance is better than its predecessor. 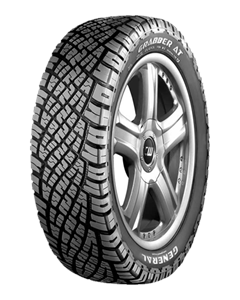 Therefore this AT tyre (All Terrain) is the solution of General Tire for increased demands for on-road driving.